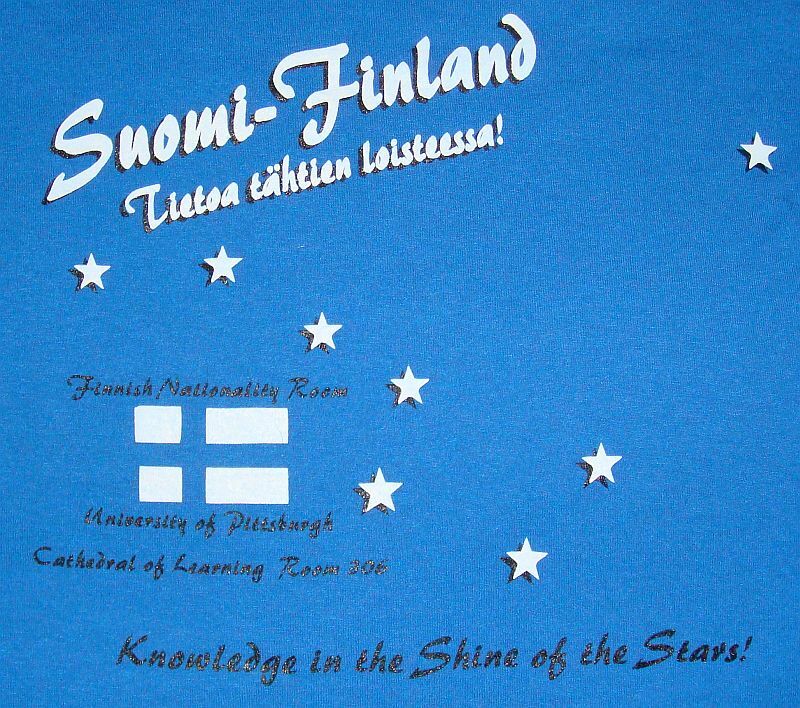 To donate by mail, write a check to University of Pittsburgh and in the memo, put Finnish Room. Please give your name and address so we can send you a receipt, and list your email if you want to receive our newsletter online. Send this to Nationality Rooms Program, 1209 Cathedral of Learning, University of Pittsburgh, Pittsburgh, PA 15260 (telephone 412-624-6150). The Finlandia Foundation Pittsburgh Chapter is an organization dedicated to the support and preservation of Finnish culture. The Pittsburgh chapter sponsors regular meetings, an annual holiday party, a newsletter, language lessons, and other cultural or social events. This group is associated with the Finlandia Foundation National, the largest private source of support for Finnish culture in the United States and encompasses the Finnish Room Committee, part of the Nationality Rooms Program at the University of Pittsburgh. The chapter may also cosponsor events with the Scandinavian Society of Western Pennsylvania. Membership is open to anyone interested in our purpose and events. News: Finnish Nationality Classroom Fundraiser: T-Shirts, Handmade Scarves, Tote Bags and More for Sale. The T-shirt design is in white and black printed on beautiful blue cotton and is available in small, medium, large and extra large. 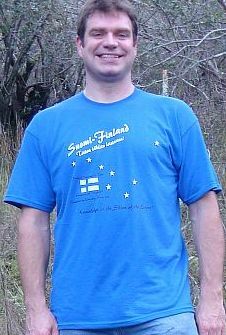 The design features the Finnish flag and big-dipper constellation. Click here for a detailed view of the T-shirt design. The big-dipper constellation is in reference to the classroom design titled The Big Dipper by architect Mika Gr?ndahl. Mika?s design for the Finnish Nationality Classroom is based on an early Finnish smoke cottage and combines tradition with modern technology. Order your T-shirt today! Click here for ordering information. All proceeds from the sale of these items are contributed to the Finnish Nationality Classroom Fund. The Finnish Room Committee has reached an agreement with the University of Pittsburgh to start fund raising for the construction of a Finnish Nationality Classroom to be added to the existing 30 Nationality Rooms in the Cathedral of Learning (right) at the University of Pittsburgh. The design of this new classroom will reflect the culture and customs of Finland. The classroom will serve as a memorial where the relatives of early Finnish immigrants will learn about their heritage and remember the contributions of their ancestors and as a place where students and visitors will learn about Finland and Finnish traditions. It will also provide a focal point for local Finnish organizations and activities. The Nationality Classrooms at the University of Pittsburgh are a centerpiece of cultural activities in Pittsburgh. A common question of the many visitors — tens of thousands every year — who tour these rooms is: WHERE IS THE FINNISH ROOM? We of the Finnish Room Committee have made it our task to correct this unsatisfying situation. We need your support: It is an ambitious goal for us to raise the $450,000 necessary to cover all the expenses of constructing this heritage classroom. To reach this goal, we need the support of other Finns and Finnish Americans throughout the United States. 1. Please consider sending a contribution to support the construction of the Finnish Nationality Classroom. Contributions may be made online, by credit card or by check. Click here to find out more on how to contribute. 2. You can also help by sharing this information with your friends, family, and local cultural organizations. To help with the fundraising effort, a flyer describing the Finnish Nationality Classroom Project is available for download at Finnish Room Committee Flyer. A poster is available for download here: FinnishRoomPoster.pdf and a complimentary 30-minute video about the Nationality Classroom program, entitled “Homelands Remembered”, is available for presentations upon request. For more information please contact Seija Cohen (seijac@aol.com). Adding a link to http://www.pittsburghfinns.net on your organizations website is another way to help spread the word.